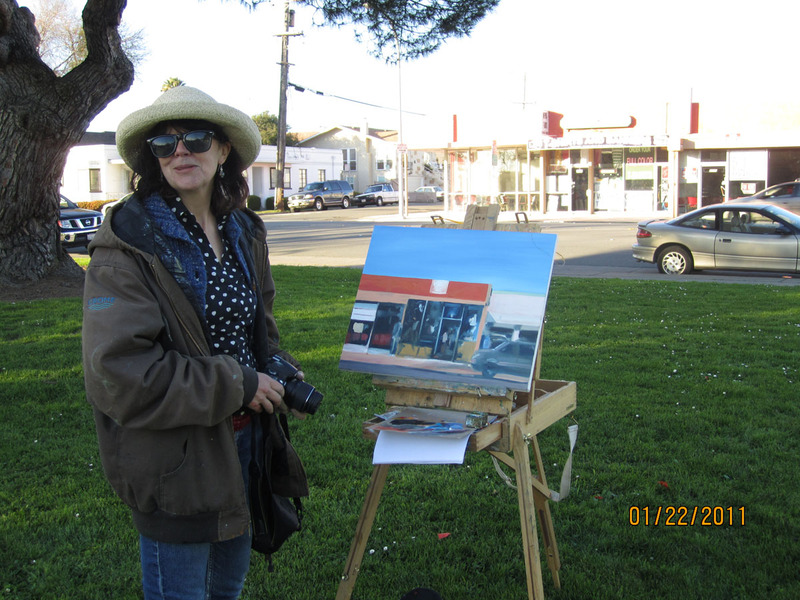 Karen took a pic of me painting in my plumber’s coat, thrift store hat and sunglasses. A new western wear clothing store called ‘Don Pancho’ was opening and I liked the intense orange of its fascia and the dark shadows inside. Two mannequins stood outside the store (3113 MacDonald Avenue, Richmond, 94804), watching the proceedings. I need to do some more work to this in the studio (my shed) and will post when I’m happy with it. This entry was posted in Art Journal and tagged Art journal, Fran Osborne, Immigrant Neighborhoods, landscape, oils, Richmond, urban. Bookmark the permalink.